For the past couple of weeks we’ve been talking about Forward bends and how to use them to stretch the posterior (back) structures of the body (along the Superficial Back Line). That’s all well and good. However, it is also possible to overdo it and overstretch different structures along the back to the point that they lose their full contractile power and become “locked long” (get stuck in a lengthened state). Overstretching the posterior structures means that there will be less support coming from the back of the body, which can affect our posture and our ability to do any sort of activity that requires back strength (which is pretty much everything except for lounging on the couch). We need to make sure that we do enough spinal extension to balance it out. Here we run into a bit of terminological confusion. 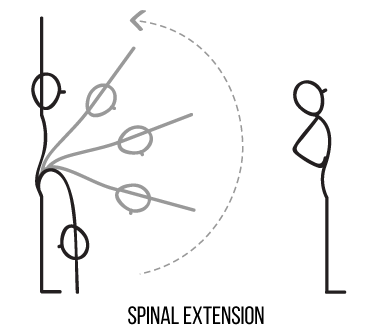 We mostly think of “spinal extension” as bending back. But technically, “spinal extension” refers to the spine returning from the flexed position back to the neutral one, as well as bending back. So when we say that spinal flexion (bending forward) needs to be balanced out by spinal extension, we mean both bending back AND returning from the forward bend into the neutral-spine position. This is another reason why we lead with the chest when we come out of the forward bend, instead of rolling up – it gives us an opportunity to contract the same back muscles that were stretching when we moved into the pose. This contraction increases circulation to the entire back and helps prevent overstretching of the supporting structures (like ligaments and fascia). And we can take that strengthening and stabilizing effect one step further by combining Uttanasana and Ardha Uttanasana. These two sister poses work very well together – in fact they complete each other! While Uttanasana stretches the structures of the back, Ardha Uttanasana strengthens them. As a result you get strong and supple back muscles. Here are some pointers on safer positioning in the postures. Exhale: Gradually contract the abdomen as you bend forward, keeping the knees soft and the chest elevated. Stay here for few breaths if you like, lengthening the spine on the Inhalation and contracting the abdomen on the Exhalation. Exhale: Move back down, relax the neck and shoulders. Stay here for few breaths, lengthening the spine slightly on the Inhalation and contracting the abdomen on the Exhalation. Inhale: Lead with the chest and go all the way up. Now the classic form of Ardha Uttanasana (with the arms extended forward) is quite strong and can be too much for the student’s back, shoulders or neck. Not to worry! There are many ways to adapt the form of this posture to make it work for you while putting less stress on the vulnerable areas. Think of those adaptations from the developmental standpoint. This is how you build back strength over time. Use this progression to gradually strengthen the upper and lower back. Use this progression to emphasize one side of the back at a time, which is very useful when working with asymmetrical muscle development. Of course, you can also choose an adaptation that fits better with the theme of your class, or is more appropriate for specific students, and so on. So there are two sides to the forward bending coin – some forward bends stretch your back structures, while others strengthen them. These two have to go hand in hand if you want to get more out of your forward bends and avoid overstretching. Great job as always Olga. It is so important to get this instruction out there for both teachers and their students. I had a former yoga instructor of mine come to me with extreme low back pain. He had to stop teaching because of the pain. His habitual swan dive and roll-up left him unaware of how he was using his low back. Overuse of the low back comes such a problem. A thousand thanks to you. Great Article, does the same apply for seated forward bends, the spinal extension?